Bullz-Eye.com recently covered the 2009 Racey Girl International Swimsuit and Lingerie Model Search Finals in the beautiful Bahamas. As part of the weekend, all the models and judges were invited to the amazing NYGÅRD Cay for a welcoming party the evening before the competition, and the gang spent all day Sunday enjoying this incredible resort. Guests at this luxurious Mayan-themed masterpiece were able to enjoy all sorts of amenities and activities from volleyball to jet skis to the in-house disco. 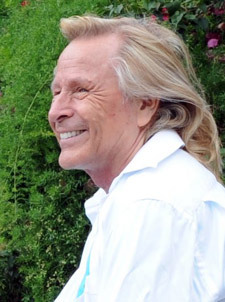 The resort was designed and built by fashion mogul Peter Nygård, founder & chairman of North America's leading fashion house, NYGÅRD International. Bullz-Eye had the privilege of interviewing Mr. Nygård during the event, where we discussed topics ranging from how he built his business empire and his incredible resort, to his philosophies for success and advice he has for young entrepreneurs. Bullz-Eye: Mr. Nygård, thank you very much for having us here. It’s an absolutely spectacular resort. Peter Nygård: Great to have you all here. BE: Thank you. I wanted to discuss your inspiration for this amazing creation. PN: This inspiration has been long time coming. It’s a combination of all my travels around the world. Ultimately I settled in on the Mayans. I actually pictured that they were going to come over here and that they were here from Guatemala and from Mexico. And then I wanted to build a Bahamian-type of house. Not a Hollywood, Beverly Hills house in the Bahamas, but a Bahamian house in the Bahamas, using all of the Bahamian type of talent and Bohemian type of structure. So that’s where the whole inspiration came from. BE: And how much of this did you personally design? On the extensive volleyball courts: "Some of the best players in the world have all been here. You know this, according to their testimony, this is their favorite place in the world"
PN: You know, I designed every last detail. PN: Every piece of architecture, actual structural engineering, landscaping, interior design. In fact no one can make a move in here without my approval, so every little detail is a labor of love here. BE: I’ve noticed how much color has been added. You’ve done quite a bit of painting as well. PN: Yes, we’re going around and repainting it again. You know ten years ago we painted this and some of the paint just dropped, like it did with the Mayans, and we repainted a lot of things. But actually, how it’s painted is the way the Mayans painted. PN: They had very bright colors. BE: I’ve also noticed the incredible staff that you have put together, in terms of attention to detail. All the guests here are really cared for. PN: Oh that’s nice. The staff is the best staff in the world and they care. They are the best because they care. So they are a very reflection of the place itself. BE: So, is your favorite part the volleyball court? I noticed you enjoy playing quite a bit. PN: Oh, I love volleyball. I get addicted to it. I play straight six hours sometimes, you know. On a day like this I could play six hours. But every night I play at least two hours. PN: Yes, and they bring the Bahamian national team here together to play with me. So the competition is really tough. BE: I’ve noticed this is not always just a casual game. The games are quite competitive. PN: Quite competitive, quite fierce. BE: I heard you mention that you have also invited the US national team. PN: I had the USA national team here last year, the Olympic team. In fact the two guys that won the gold medal were here. The guys who were on the team were here. Some of the best players in the world have all been here. You know this, according to their testimony, this is their favorite place in the world. BE: No kidding. Well I can see why they are so impressed with it. BE: Yes, not just the surroundings. PN: Not just the surroundings but to play volleyball. The sand, the circumstances. You know, it’s the best volleyball court as far as they are concerned. BE: And then the incredible climate of course. So how did you fall in love with the Bahamas, versus other islands in the Caribbean? What drew you to this place? PN: You know, water. The water is the most beautiful water in the world. Just look at the color of it. When you go into the islands, you go into the island because there is water, and the Bahamas have the best water in the world. Beautiful sand, beautiful blue color. And it’s very close; it’s not inconvenient. You can get here within three hours, two and a half hours. So going to this very rustic place in a matter of a few hours is very convenient. It’s a very safe government as well. It’s very civilized. So it is by far the best of the islands. BE: Now this place would be impressive enough alone if one person had devoted all of their time to this. But you’ve managed to do this while building up one of the most impressive retail companies in the world. So this was your hobby, but your main focus was your business. On his hands-on approach to business: "I’m there leading the way. I’ve done every part of it, whether it is carrying fertilizer on my back to sweeping the floors, to every aspect of business. No one can tell me about any part of the job that I really don’t know about or haven’t done myself." PN: Yeah, this is the hobby and the business really takes up most of my time. And my main business, the fashion business, is really to a business what this is to a house. It’s very unique, very special. Run by technology. You know we are the most technological company in the world? We have the most sophisticated systems in the world. And we have a major competitive advantage because we sort of did the same thing there as we have done over here. This is visual, that’s not as visual but it works the same way. BE: I was struck by how early you became focused on technology as a competitive advantage, verses other companies in this space. The systems you have to track your product are comparable to companies like Federal Express and other high tech companies. PN: Yes. In fact, Federal Express comes to study us. Other companies that have a reputation for being what you call ‘fast to market’ are manually fast to market. They come and study us on how they can make their ‘fast to market’ business now technology fast to market. We’re leading the whole world in that way, we win a lot of awards for our technology. BE: And you obviously have a huge presence in Canada, that’s where you are from. And now you have quite a bit of penetration in the US market as well. PN: Actually, our USA penetration is now bigger than Canadian. BE: It’s now outgrown the Canadian, okay. PN: Now many people regard us as number one in North America. Big business growth is dramatic in the United States. BE: Have you ever considered moving into any men’s lines? PN: Yes, to the degree of licensing. We have men’s wear licensing for men’s suits, for underwear. We have about 17 licenses total on sunglasses, lingerie, bathing suits. Pretty well all women’s and men’s apparel and accessories. BE: Given your background and what you were able to accomplish, what advice would you give to a young person who wants to be an entrepreneur? PN: You know, it’s the age old advice. It’s the advice of getting focused. I made a speech when I was just graduating out of college, to a graduating class of high school at the closing ceremonies. It was all about the very topic that you talk about, success. And I still read that speech. It has the matter of developing the right attitude, setting up your goals and then paying the price. Those are simple things. But you really have to have that attitude in the first place. Then you ambitions and goals and realistic goals and then you go to work. PN: You work and practice every day. Just like I play volleyball there. You know, I had ambition of playing it well and what did I do? I practiced a lot. BE: You strike me as someone who is very precise in what he does. From how you approach business, to how you approach your hobby, to how you approach even things like fun, like volleyball. PN: Very precise, yes. I think it is sort of my claim to fame, how meticulous I am to details. It drives other people nuts. And how I see details. You know, I can see something off a quarter of an inch. So I can see fashion and see what it is, what colors, what’s right or wrong. So I have this meticulous eye to detail and meticulous attention to detail. And quite frankly, that is the essence of my success. I must say that most people that I know that are successful, also are very detail oriented. PN: I think that’s one of the words of this success question you asked earlier. You’ve got to be meticulous. And meticulous means you have a lot higher standards than the average. BE: Right. And I would imagine it’s also getting your hands dirty, getting every detail of the company. PN: Getting your hands dirty is pretty well the essence of my success as well. I’ve never have asked anybody to do things that I wasn’t ready to do and in fact did myself. So I am sort of a little bit like Alexander the Great, I’m leading the way. I’m in the middle of the battle and I’m not sitting on top of the hill commanding: Be successful! Be successful! I’m there leading the way. I’ve done every part of it, whether it is carrying fertilizer on my back to sweeping the floors, to every aspect of business. No one can tell me about any part of the job that I really don’t know about or haven’t done myself. BE: I see exactly what you are saying. In today’s very tough environment, I’ve read that your company is doing very well. In many ways, like other strong companies, you’ve become more aggressive when times are tough because other people pull back. What advice would you give to other companies in this situation? And entrepreneurs, who aren’t maybe quite as strong with their companies right now while they are facing this adversity. PN: There’s a saying ‘when things get tough, the tough get going’. We always excel at a time when it is the toughest times. I guess first of all, we have the determination we have now. We made the statement we refuse to join this recession. It’s an attitude in the first place. And then we’ve done all kinds of things to refuse. Including charging full speed ahead and planning increases as opposed to planning decreases. So you know, you tend to fulfill your own prophecies. And when people prophesize about going down, they do. The other thing about our business is it is safe. Retailers, our customers feel safe with us. Our product is a safe product, our systems are safe, and our company is safe. So when it comes down to not gambling too much, they turn to us. BE: At this point in your life, with how much you have accomplished in business, how much you have accomplished with what you have created here, what other dreams are you looking forward to? What’s across the horizon? PN: You know, the dream is to continue to play basketball so to speak. It’s a little bit sort of like Michael Jordan. You already know the guy was making his last shots and you keep playing as long as you can. You play the sport that you are playing. There is no dream to get into a different world. There is no dream…this is a dream of fully tapping the world that you are in. The issue of how to give back keeps coming back to mind, you know. How to share. So you start turning your attention to that kind of thing. Even sharing this place right now. This event here is sharing. PN: And that keeps coming back to me all the time. Somewhere down the line it all ends. And how you want to be remembered, what you want to do with it starts to become part of the plans now. BE: And one of your interests, in terms of sharing is with the national team, the volleyball team. PN: Yes, I want to take people who are semi-successful and make them very successful. I tend to work with people who are talented and see if I can make them even more talented. I tend to work with people who are very handicapped and see if I can pull them out of it. Especially work on the outer edges, you know and concentrate my activity on those two areas. But to me, my life is all about a builder. A builder, you can see it here, building structures, building systems and above all building people. BE: And in terms of the resort, any plans? It’s a work in progress I heard you say. PN: Surprisingly, the place is only 50% done. BE: No kidding. Now that is hard to believe. PN: It’s hard to believe. See, what I see as unfinished the average laymen would not. They would walk in and say “oh, maybe the aquarium is not finished.” So they already forgive all those parts that aren’t perfect because there are so many things that are perfect. But for me, I see so much more that I can do and should do. 50% is a good number. BE: Well, it gives you quite a bit to do. It will keep you busy. PN: That’s right. That’s the fun part, to keep busy doing your hobby. BE: Well thank you very much for your time. I really enjoyed speaking with you.